Lebanon Valley College recognizes academic achievement in a variety of ways. 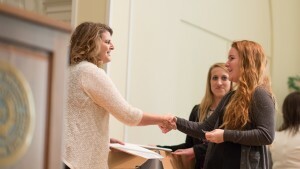 In addition to the dean's list and graduation with honors, the College recognizes several academic honor societies. Alpha Kappa Delta is the international sociology honor society. Students who maintain a 3.0 average in sociology and a 3.3 average overall are eligible to be inducted into the honor society at a ceremony during their senior year. Inducted students will be awarded a teal honor cord to be worn at Commencement. Alpha Sigma Lambda is a national honor society whose aim is to recognize the special achievements of non-traditional students who accomplish academic excellence while facing competing interests of home and work. To become a member, students must be at least 24 years old, a matriculated student seeking an initial degree, completed 24 credits at LVC, completed 12 credits in the liberal arts and sciences, earned a minimum 3.4 overall GPA, and be ranked in the top 20 percent of students meeting the above criteria. Beta Beta Beta, a national biological honor society, is open to majors in the biological sciences by invitation. To become a member, one must have completed three courses in biology with a GPA of 3.0 in biology and 3.0 overall. Delta Alpha Pi is an international honor society for students with disabilities. Established in 2004, Delta Alpha Pi presents an opportunity to change negative perceptions of persons with disabilities by recognizing those with exemplary academic records. Undergraduate candidates must have completed a total of 24 credits and earned a cumulative average of 3.1. Delta Mu Delta, LVC’s honor society in business, is open to accounting, business, economics, and international business majors. Selection is made by Business Department faculty. Membership is open to those with junior or senior status and a department GPA of 3.4 or higher and a College GPA of 3.25 or higher. Candidates for membership must also exhibit participation in department, College, or community activities demonstrating leadership and non-academic involvement. Gamma Sigma Epsilon is a national honor society for students achieving high standards of excellence in the study of chemistry. Active members of the chapter shall be composed of students who have completed a minimum of 20 credit hours in chemistry or biochemistry & molecular biology, at least three credit hours at the 300 level, with a minimum grade point average of 3.3 in all chemistry or biochemistry & molecular biology courses and at least a 3.0 overall grade point average. Kappa Delta Pi is an international honor society for education students dedicated to promoting excellence in the profession through the advancement of scholarship, leadership, and service. Membership is open to students who have completed at least 30 credit hours with a minimum of 12 credits in professional education courses. Leadership abilities and a cumulative GPA of 3.6 are also required. Kappa Pi is an international collegiate art honorary fraternity and was founded in 1911. It is open to any student who has talent for or supports visual art. Kappa Pi has 360 collegiate chapters across the United States and internationally. Membership in Kappa Pi is divided into six classes: active, alumni, sponsor, faculty, associate, honorary, patron, and life. Active members are students who are currently matriculating at a college, university, or art school. Active members transfer to alumni membership after they graduate. Requirements for membership are the completion of 12 semester hours of art courses, a 3.0 GPA in art course, and a 2.0 overall GPA. Phi Alpha Epsilon (the Greek initial letters of the words, “lover of learning and finder of truth”), the College’s honor society, was established in 1935 and recognizes academic achievement and service to others. To be eligible for this award, students must achieve a cumulative grade-point average of at least 3.6, complete at least 24 credits of Constellation LVC coursework, and achieve the “bronze” level of service hours (as determined by the Office of Spiritual Life) at the conclusion of the fall semester prior to graduation. Ordinarily, seniors are formally welcomed into the society at a spring banquet. Phi Alpha Theta is a national honor society dedicated to the study of history through research, teaching, publication, and the exchange of learning and ideas. Membership is awarded to undergraduates who have completed 12 credits in history and achieved a minimum grade-point average of 3.5 in history and 3.4 overall. Phi Sigma Iota is an international honor society that recognizes outstanding ability in the field of language studies, literature, and cultures. It promotes international communication and understanding and is the highest academic honor in the field of languages. Selection is made by languages faculty. Members are selected from language majors and minors with a department GPA of 3.0 or higher and a College GPA of 3.0 or higher. Phi Sigma Tau is the international honor society for philosophy, dedicated to encouraging interest and activity among students and to promoting ties between philosophy departments in accredited institutions. Eligibility requirements include the completion of three full semesters and at least two philosophy courses, and a 3.5 GPA in philosophy classes. Inducted students must rank in the upper 35 percent of their class. Pi Mu Epsilon is a national honor society dedicated to the promotion of mathematics and the recognition of students who successfully pursue mathematical understanding. Pi Sigma Alpha is the honor society for politics. Members qualify for graduate school scholarships in political science and tuition reductions for certain Washington internship programs. Undergraduate candidates must have completed 60 credits, at least 10 of which are in politics, and a cumulative grade point average of 3.4 or higher. Affiliated with the American Psychological Association, Psi Chi is the national honor society for students who are psychology or neuroscience majors or psychology minors. Students must have a College and departmental GPA of 3.2 or higher. Sigma Iota Rho is an honor society for international studies. It promotes and rewards scholarship and service among students of international and global studies. Members must be of junior standing, have completed at least 21 credits toward a major or minor in global studies, and have participated in an approved study abroad program. Students must have at least a 3.3 GPA in global studies and 3.2 overall. The national physics honor society, Sigma Pi Sigma, recognizes outstanding scholarship in physics and promotes an attitude of service. Members must have completed 45 credit hours, 12 credits of physics coursework, and have at least a 3.5 GPA in physics and 3.4 GPA overall. All members must rank in the upper third of their college class. Sigma Tau Delta, an international English honor society, is open to junior and senior English majors who achieve a major and cumulative GPA of 3.5 and obtain faculty approval. Theta Alpha Kappa is the only national honor society in the fields of religious studies and theology. Members must have completed three full semesters with a minimum of 12 credits in religion. A GPA of at least a 3.5 in religion courses is also required, as is a 3.0 cumulative GPA. Inducted students must rank in the upper 35 percent of their class.